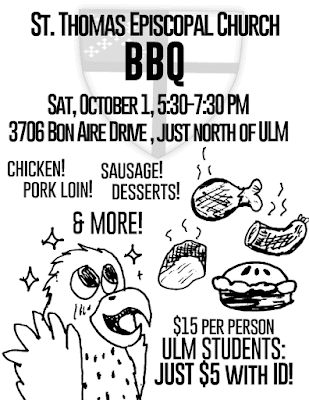 Please join us on the bayou for the 61st annual St. Thomas BBQ. Saturday, October 1st - 5:30-7:30 p.m.
:-) In a completely unrelated item - St. Thomas's will hold our annual blessing of the animals on Sunday Morning, October 2 at the 10:00 a.m. celebration of Holy Eucharist. Bring your pets! 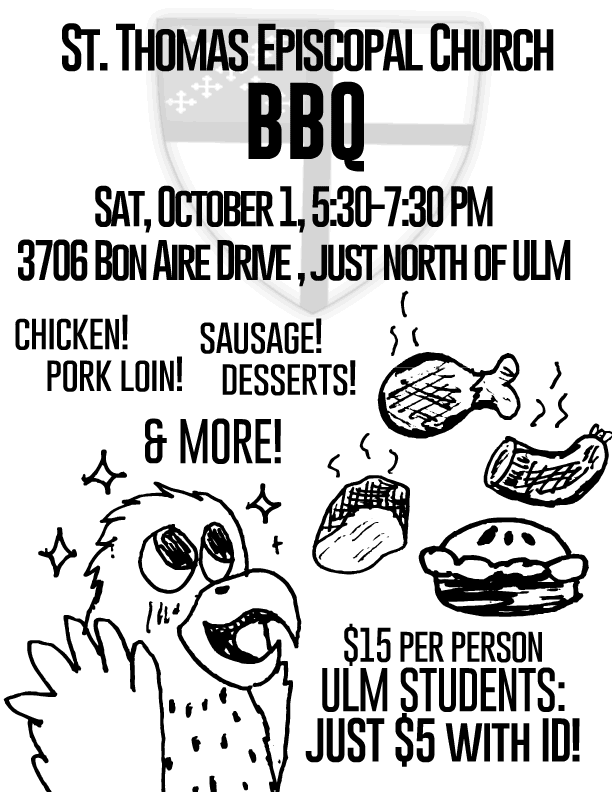 Please join us on the bayou for the 61st annual St. Thomas BBQ. 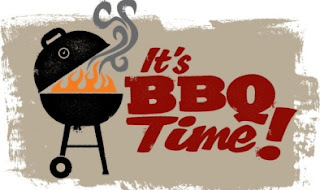 The event will be held Saturday, October 1st from 5:30-7:30 p.m.
Our menu includes chicken, pork loin, sausage, baked beans, potato salad, and homemade desserts – the fun includes music and a cakewalk. This is an opportunity for good food, fun and fellowship. If you have any questions, please call and leave a message at 318-343-4089. St. Thomas' Episcopal Church is located at 3706 Bon Aire Drive on beautiful Bayou DeSiard, here in Monroe. Join the women of the church on Wednesday night, September 21, following the 5:30 p.m. Holy Eucharist for our Ladies' Night Out. We will meet at the West Monroe location of Avocado's Restaurant - 205 Constitution Drive, (restaurant row) for food, fun and friendship. Hope to see you all! Please join us this Sunday, September 4, after church on the Sun Porch for our monthly potluck. Bring your favorite dish to share.